SH 161 opened, except for one lane just after 5 p.m.
UPDATE: Latest updates to this story can be found at this link: Investigation Into Bus Rollover Continues. 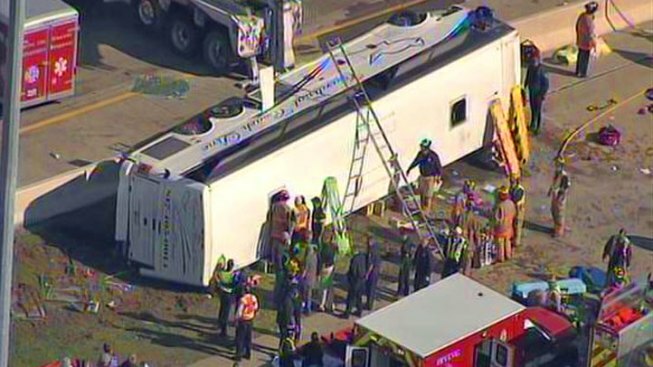 Two people were killed and more than three dozen were injured when a private charter bus overturned along the President George Bush Turnpike in Irving on Thursday morning. The bus was headed to Choctaw Casino Resort in Durant, Okla., a passenger told NBC 5. The bus was going northbound on the turnpike when it veered to right and back to the left before flipping over near Belt Line Road at about 9 a.m.
Two people were killed in the crash, said Department of Public Safety spokesman Sgt. Lonny Haschel. Their names have not been released. 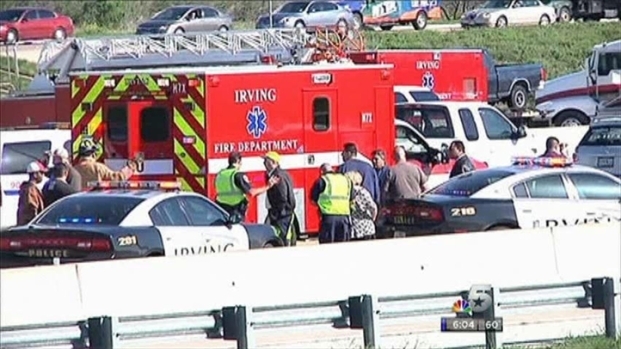 Witnesses in traffic rushed to help injured passengers after a charter bus crashed Thursday morning on the President George Bush Turnpike in Irving. Forty people were transported to area hospitals. Irving fire officials said 45 people were on the passenger list. Law enforcement officers were interviewing bus passengers and other drivers who witnessed the crash. The wreck occurred near an interchange with a second highway, snarling traffic for several miles. Sixteen patients are in critical condition, while many others sustained only minor injuries, according to emergency crews. The injured were sent to various Dallas-area hospitals, including Baylor Irving Medical Center, Las Colinas Medical Center, Parkland Memorial Hospital and Methodist Hospital in Dallas. The Dallas County medical examiner was also called to the scene. Anyone searching for family members can call 972-721-INFO (4636) to find out where passengers were hospitalized. Injured passengers who were able to walk were loaded on a Dallas Area Rapid Transit bus for transport to Baylor Irving Hospital. Baylor staff is calling in extra staff to help deal with the injuries. Dr. Paul Pepe, of Parkland Memorial Hospital, said doctors were taking a closer look at every injury. "Being elderly, we are watching them like hawks," he said. Dr. Alex Eastman, Parkland director of trauma, said four patients there between the ages of 66 and 80 were in critical condition. DPS said the bus was traveling northbound when the bus drove onto the right side of the road for an unexplained reason. The bus hit a rubber attenuator and traveled back across all lanes of the turnpike and onto the grassy median before running up along the middle concrete barrier. The bus flipped over and slid on its right side, the same side as the exit doors. Trapped passengers had to use emergency hatches on the roof and push out the windows on the left side of the bus to either climb out or await rescue by passers-by and emergency crews. DPS said northbound Highway 161 and the George Bush Turnpike would be closed while the investigation was conducted and spilled fuel was cleaned up. The bus was moved and almost all lanes of the highway reopened late Thursday afternoon. The southbound lanes were open, but drivers were encouraged to avoid the area and instead use state Highways 114 or 183 or Interstate 635. A man who answered the phone at Cardinal Coach's offices in Mansfield confirmed that one of the company's buses was involved in the crash. He said he didn't have time to talk because he was trying to gather information about the crash. According to FMCSA's online record system, Cardinal Coach Line was given a "satisfactory" safety rating in 2009. In the past two years, none of the company's five buses has been in a crash, the records say. But the company's two inspections over that period found violations that resulted in putting a bus and/or or a driver out of service. The National Traffic Safety Board announced they are also sending a team of regional investigators to the scene of the bus crash. "People Stacked on Top of Each Other"
Passenger Dan Risik told NBC 5 that the charter bus had left for Choctaw Casino Resort from a Wal-Mart parking lot. After the crash, Risik said people were laying on other people, trapping individuals underneath each other. Risik said many of the passengers included retirees and senior citizens. "I was sitting towards the back, luckily, and I just heard noise all of the sudden and some scooting, and grass flew in it, and somebody started pulling me out the window," said Ernie Johns, another passenger. Johns said he couldn't find the woman who was sitting next to him. "People were piled everywhere and thrown everywhere and standing on my head on the other side of the bus," he said. Robert Hare and Ed Cluck witnessed the aftermath of the crash and stopped to help injured passengers. "A lot of people in shock, broken bones," Hare said. "[There are] a couple of people who are dead. They were crushed under the bus." "You see this bus on the side of the road, and what can you do?" Hare said. "You just stop, you get out and you do whatever you can to help." "[I] just saw this big, white smoke. My first thought, it was a street sweeper. Man, that's awfully odd, a street sweeper," Ed Cluck said. "Cars started slowing down, and you realized it was a vehicle on its side -- and obviously a big one. [I] stopped, jumped out and got to the front of the vehicle. You look into [it], see who you could help, and it was just people stacked on top of each other." Hare and Cluck helped pull passengers from the bus. "[We] popped the roof hatches and try to get out everybody we could," Cluck said. "It was pretty bad; people screaming. There was obviously a lot of pain. It was bad." NBC 5 reporters Ken Kalthoff, Jeff Smith, Keaton Fox, Christine Lee, Andres Gutierrez and Eric King and editors Greg Janda, Frank Heinz and others contributed to this story.